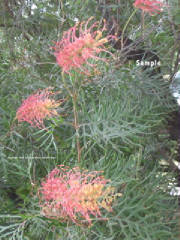 Grevillia. A native flower of Australia. Gravillia tends to be woody and spindly unless you prune it rigorously. Iceberg roses that grow brilliantly out west, despite the unrelenting heat.